Rabbi Menachem Altein helped to light the menorah during a meetup organized by Harvard Chabad to light a menorah that was toppled over the weekend. The Cambridge community came together Thursday night in a show of unity after a man allegedly toppled a large menorah over the weekend that was set up on Cambridge Common to celebrate Hanukkah. Harvard Chabad, the student organization that placed the religious symbol at the park, organized the 5 p.m. event, which included a special speaker and presentation from Cambridge Mayor Marc C. McGovern. On Sunday afternoon, two witnesses told police that they saw a man, dressed in all black and riding a black bicycle, walk over to the menorah before knocking it down. The suspect then fled the scene on his bike, according to police. Cambridge police spokesman Jeremy Warnick said that the incident is being investigated as a hate crime. The alleged suspect has not yet been identified, but police are seeking possible surveillance footage taken from the general area, he said. 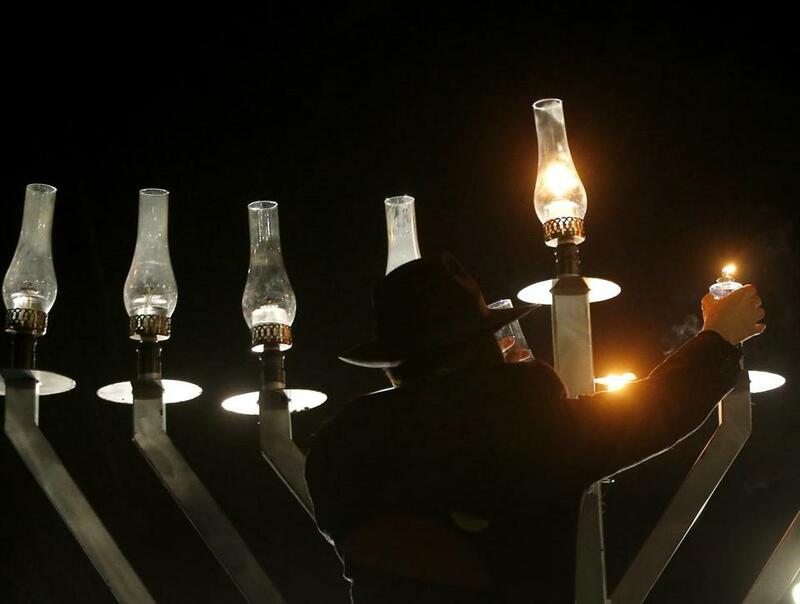 Sunday was the first night of Hanukkah, a Jewish holiday celebration that lasts eight days. Passersby who came across the overturned menorah, which has light bulbs on top, banded together to help lift it back up into place Sunday, an act of good will that was lauded by Harvard Chabad and Cambridge elected officials. Lillian Carrasquillo, who was there as people erected the menorah, took video of the touching scene and then posted it to Twitter. She said one of the people who helped lift the menorah — a man she described as an “older Jewish gentleman” — then said a prayer. That man later identified himself on social media, as the story gained traction online. A Facebook statement from Harvard Chabad, announcing Thursday’s community gathering, alluded that Suskind will “address the occasion and serve as our lamplighter” as another light bulb is turned on to celebrate the fifth night of Hanukkah.